With the possible exception of the slouchy hats that share her namesake, Beanie Feldstein ’15 is one of the most common sights to behold at Wesleyan. Her frequent appearances in Second Stage shows, her expert tour-guiding skills, and her bubbly demeanor have made Feldstein highly visible—not to mention widely admired—on campus. Feldstein spoke to The Argus about her passion for camp (of both the summer and Streisand varieties), her failed Disney pilot, and a traumatic incident involving “Shrek”-themed condiments. The Argus: What do you think makes you a WesCeleb? 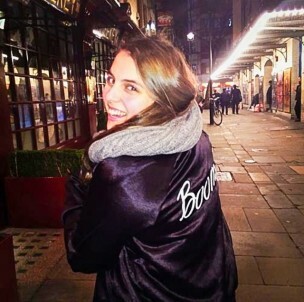 Beanie Feldstein: Oy. I think I’m definitely a bubbly, outgoing person. I think also the name. Just the name. It’s easy to remember and recognize that once you’ve met me once. Just because of the name, you’ll probably remember who I am. So I’ll go with the name. A: How did you get your nickname? BF: My given name is Elizabeth, and I had a British nanny for the first five years of my life. Elizabeth was the name of the girl she used to nanny in England. She was from England—the queen, you know, there are a lot of Elizabeths in England—and Elizabeanie was what their family called the girl she used to nanny. And so she started calling me Elizabeanie, and I have two older brothers, and they’re like, “Let’s just call her Beanie! Let’s just call her Beanie.” And like, if you call a dog Spot but its name is Spike, it’s just gonna respond to Spot, so I just always responded to Beanie. Since I was like, two years old, it was just exclusively Beanie. And I think it was, as we say in Yiddish, bashert, which means “meant to be,” because it really fits me and I love it. I couldn’t be more thankful for it. I think it’s great. A: Can you talk a bit about acting and theater and how you got into that? BF: I was weirdly obsessed with Barbra Streisand growing up. My third birthday theme was “Our Funny Girl is Turning Three,” and my mom is a costume designer so she made me a replica of one of Barbra Streisand’s Fanny Brice outfits. So I just grew up watching a lot of musicals. I was just really drawn to them. And then at five, I was in my first show, although growing up, I had nodules on my vocal chords, so I kind of sounded like a smoker. But my mom went to [a] psychic that told her I was gonna go by one name and gonna be a singer, and she was like, “But my daughter literally can’t talk. She can barely say, ‘I want milk,’ because it sounds raspy.’” She was like, “There’s no way my daughter’s gonna be a singer,” and I ended up being super into musicals, and I did all growing up. I first started in regional theater, and then community theater, and the high school theater, and then professional theater, and on campus. I’ve done all my theater through Second Stage, and I’ve done 14 shows on campus in my four years, and it’s been awesome. I think it’s so amazing that Wesleyan has a thriving theater community that’s not necessarily through the department, which is really nice. A: Do you have a favorite Wesleyan theater memory that stands out to you? BF: “The 25th Annual Putnam County Spelling Bee” was my first show here, and that was amazing. That show is so fun. It has built-in improvisation to it because you bring up guests to be extra spellers every night, so it does change just inherently in the script. The words that they choose are different every night that they spell, and it’s so fun, and my character was so outlandish. A: Who did you play? BF: I played Logainne, who’s the one with the lisp and the two gay dads, and it was so fun. I would love to do that show. I could do it every day of my life. A: What made you want to do sociology instead of theater as your major? BF: I was lucky enough to room with Gwen Rosen [’15], who I still room with—we [have] lived together for four years—and she took Intro Soc with [Assistant Professor of Sociology] Greg Goldberg freshman fall. She loved it. She was like, “You should definitely take it.” I was like, “okay.” I kind of thought I would do psych or English with theater, so I understood that I liked social sciences a little bit, but I was like, “Sure, I’ll take Intro Soc,” and his class just blew my mind. He definitely shaped my love for the discipline and I was like, “You know what? I have my whole life and my whole outside-of-school life to shape around acting.” I was like, “Why don’t I just take this time to really learn about something and really think about something that I don’t often think about or I didn’t grow up thinking about?” And I could not be happier. I think it’s definitely my main takeaway from Wesleyan…the Sociology Department and the discipline and finding my love for academics through that. A: I was told to ask you about your nails. BF: My nails? Okay, well right now they’re just white because I just did “A Midsummer Night’s Dream” and we thought white would be fun for my character. I play [Puck]. But I don’t do a lot of beauty stuff. I never really do my hair. I never wear makeup, ever, unless I’m in a show. But I always love to get my nails done, and usually I do some crazy nail art stuff—I’m really bad at it. I throw a temper tantrum every time I do my own nails ’cause I’m so bad at it. But I have a deep obsession with nail art. Like, my Instagram, I follow like, puppy Instagrams and nail art. That’s all it is. A: So you’re into nail art even though you don’t do it. BF: Yeah, I can’t execute it on my own self, but I will spend my money on getting really fun nails. It’s my way that I spruce up because I wear a lot of black and gray and neutral tones, but my nails are always fun and vibrant and interesting. A: Okay, tell me about your fear of colored tongues. BF: I’m legitimately petrified of colored tongues, teeth, lips, colored mouths. So particularly traumatizing was that time—I was in sixth grade, I remember it so well—when there was like, “Shrek” ketchup. Do you remember this at all? A: I remember the green ketchup. BF: It was green, but Donkey was blue, and purple for Fiona. Each kid could bring in a special food for their birthday, and everyone would always bring in cake or cupcakes and this one kid was like, “I’m gonna bring in French fries and the fun ketchup,” for his time, and I literally ran out of my classroom crying because everyone had green and purple and blue mouths. Oh my God, thinking about that makes me want to cry. And my bunkmates at camp knew about my fear, and one year there was this Kool-Aid ad that was like, kids sticking out their tongues and it was all different colors of the different Kool-Aid flavors, and they taped them to the top of my bunk so that when I woke up in the morning I just saw all these colored tongues and I started crying again. I don’t know why. It’s just unnatural to me. Like, red doesn’t bother me, cherry, because it echoes or reflects the color of your tongue. It just freaks me out. I don’t know why. It just really gives me weird feelings. So I don’t eat a lot of lollipops or popsicles or anything. A: I would hope not. Can you talk a little bit about the project you were filming over spring break? BF: Sure. I can’t say too much, but I was filming a pilot for HBO where I’m a recurring character. First of all, someone is looking out for me because it filmed literally in the days of spring break from beginning to end but didn’t interfere with school at all other than the audition process. It was literally the best experience of my life, both just personally and as far as like, my “career” goes. The team and the actors and the whole crew were just so kind and lovely and fun. We were on location in Boston. I hadn’t spent a lot of time of Boston until the filming, and I love that city. It was so fun to explore. I was really stretched as an actor because I was expecting to do much more comedy than drama, and it’s definitely a drama. Gus van Sant, who is the director, and Jenji Kohan, who’s one of the writers and creators—you know, they’re really big names. A: Do you want to act after you graduate? BF: Yeah, definitely. Definitely, definitely. I’m moving to New York, because theater will always be my first love. There’s really no theater in L.A. The New York film and television scene is also really amazing. Some of my favorite shows film in New York, so I’m really excited to do that, and hopefully some writing, too. Keelin Ryan [’14]—who graduated last year—she and I write together. We have some stuff in the works. A: Can you talk about what media you consume? Your favorite shows and movies? BF: Sure. So when you walked in, my roommate Sarah [Corey ‘15] and I were watching “Friends,” which we watch at least one to two episodes [of] every single day. Deep fans. I’m also a big lover of network television. I’m taking Television Storytelling right now with [Professor of Anthropology] Betsy Traube, and she and I are the only ones that really watch network TV in our class. I’m a huge “Grey’s Anatomy” [and] “Scandal” fan, so Shonda Rhimes is, like, my God. I love “Mad Men,” I love “Jane the Virgin,” which just came out, I love “Dance Moms.” Huge “Dance Moms” fan. I also love “Broad City,” “Playing House,” “The Comeback,” “Parenthood,” and “Friday Night Lights.” I don’t really care about high-brow, low-brow. I just like what I like. A: Do you have any hidden talents? BF: I used to horseback ride, and that’s something that I still really love to do and I wish I did more often…. Horseback riding in L.A., where I grew up, is kind of difficult because it’s far out of the city, so if you’re gonna do it, you have to dedicate your whole life to it—and [my mom] was like, “You don’t have enough time in the day to do horseback riding and theater.” So I kind of made the decision early on to do theater, but I love horses, and I’m still fairly good on a horse. A: If you weren’t gonna do acting, what would you do? BF: Oh, for sure own a summer camp, or run a summer camp if I didn’t own it. I would definitely want to run it. Whether or not I owned it is up for debate. I love camp. My parents met at camp, and both sets of my grandparents met at camp, so camp holds a deep place in my family’s heart. I went to camp for 10 years and it was the best. I’m such a summer camp person. I went to a more traditional campfire sports camp, and then I also went to a theater camp, so it was nice. I kind of got a little bit of both worlds, but I love camp and I think camp is so important and amazing. I would love to do that. A: Who are your biggest role models? BF: My mom. She’s such a Renaissance woman. She’s changed her career three or four times and is so successful at whatever she does. She doesn’t really see any limits for herself. She’s almost 60—sorry to out your age, Mom—but she basically started a new career like, five years ago and is thriving, and I think that’s amazing. My brother is a really big influence on me and such a great person, and we have such a beautiful connection. As far as people I don’t know, Barbra Streisand, as I mentioned. Definitely Kristen Wiig, Melissa McCarthy. Someone joked to me at one point that, “What if Melissa McCarthy ever played your mom on something?” and I full-on started crying. Like, full tears. Just the thought of it was too much for me to handle. And this Broadway actress Jessie Mueller, who plays Carole King in [“Beautiful]: The Carole King Musical.” Carole King’s also an influence of mine. But Jessie Mueller, I think she’s just the most talented Broadway actress around right now. A: Do you think [growing up in L.A.] informed your interest in acting now? BF: No! Not at all. I was just obsessed with theater, which is, as I said, the minority in L.A. It’s hard to find theater in L.A. that’s not like, a tour coming in from somewhere else. So not really. My dad sings. My dad’s so cute. He sings with his little guitar. He’s such a nugget. So my dad sings, and my mom is ridiculously hilarious, so I think that combination, it’s very clear where I came from. But as far as acting, no, not really. And my brother kind of got into it a little bit later. He wasn’t a child actor or anything. A: Speaking of child acting, do you want to talk about your capstone project? BF: So I wrote my senior [sociology] capstone essay on the unique social position of non-famous or non-household name child actors, so not like, your Abigail Breslin or your Dakota Fanning, but you know, like, the kid in the Kraft commercial who you would have no idea what their name is, but they’re getting paid to work. I kind of argue that because they’re being compensated and they have an adult occupation, but they still go to school and have the social life of a child, they’re in this unique social position that not many people get to occupy, and that they navigate between the worlds of childhood and adulthood in a unique way, but without the scrutiny of the public eye because they’re not in it. It was really cool to think about, especially because I did grow up around a lot of people like that and I know a lot of people in that position. A: Did you act professionally as a child? BF: I did one professional theater show when I was 10, and I was on a Disney pilot when I was a senior in high school, where I was the oldest kid on the show, so there were other child actors on there. So not really. My parents were really focused on me going to school, which I really appreciate, because I ended up loving school and being such an academic person. A: I’m intrigued by this pilot. Can you say more? BF: It was a spinoff of “High School Musical” called “Madison High.” It was bizarre. Growing up, I had an agent starting at nine years old, but I would maybe go to one audition a year. My parents were always like, “If it was Broadway, she could leave school because it’s so in her and it’s so her passion,” but very rarely did I ever go out for film or television. But they were looking for this show and they really wanted singers and actors, but not actors who could sing. Like, equal parts singing and acting. So randomly, I went in for this TV show. I went in for it a week before I applied for Wesleyan and then it ended up taking me longer to get the part than to get into Wesleyan. My first audition was in November, and I got the part in March, which is crazy, so it takes a long time sometimes. But yeah, it was really fun. It was a really, really fun, weird, crazy experience. I thoroughly enjoyed this interview. Beanie Feldstein is destined for stardom. Her words clearly exude the enthusiasm she has for her present , past and future. To know this fine young lady ,one is certain, you’re just gonna lover her! !